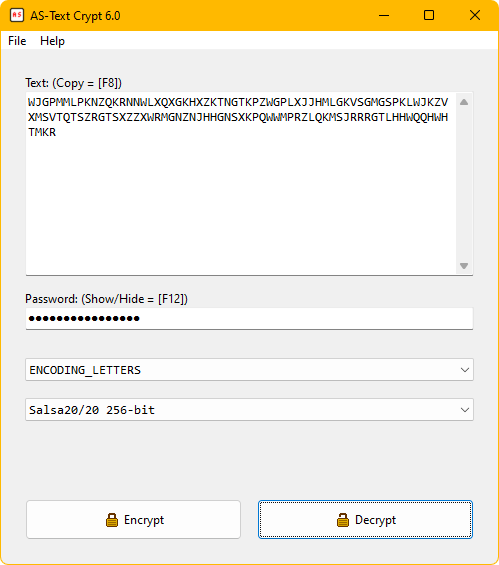 AS-Text Crypt 6.0 - Encrypt text with Salsa20, ChaCha20 or HC-256. Encryption program for text that uses Salsa20, ChaCha20 or HC-256 with a 256-bit key. Encodes the encrypted information for easier handling. 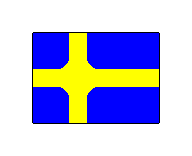 In addition to offering HEX, there are also two other encoding methods, one with only letters and one with only symbols. Can be used to only encode the text, then leave the field password blank. This encryption program makes use of a key strengthening algorithm which delays the final encryption key for a few seconds, this increases the security. The program compresses the text to increase the security. The program stores an encrypted checksum of the compressed original text, which is verified at decryption. You don't need to enter the password twice, instead you can press [F12] if you want to show or hide the password. Save the downloaded program if you have information encrypted with it. I do not guarantee compatibility between different versions/revisions of the program. Check out AS-File Crypt 6.0.